Having spent two years in the Katusha/RadioShack wilderness, Belgian sprinter Gert Steegmans has returned ‘home’ to the Quick Step squad in an attempt to revitalise his career. After stage wins in the 2007 and 2008 Tour de France and Paris-Nice, Steegmans decided to jump out of Tom Boonen’s shadow at Quick Step and strengthen his career as a sprinter and classics specialist. First he signed with Russian squad Katusha in 2009, an agreement which was terminated prematurely after Steegmans refused to sign the squad’s anti-doping charter in the summer. Then followed a signing to Lance Armstrong’s RadioShack for 2010, but Steegmans failed to bring home any results after suffering from crashes and bad form. Despite signing Steegmans until the end of 2011, RadioShack has agreed to release him. Now he has returned to his ‘home’ team in Belgium, no doubt hoping to regain his 2008 form. The move comes after Steegmans was spotted talking to Quick Step team boss Patrick Lefevre at Boonen’s charity cyclo-cross event in early December. 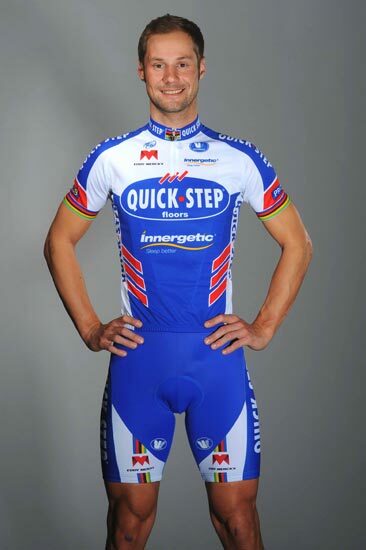 Meanwhile, Quick Step has relased images of Boonen and the team out training wearing the revised team strip. Rather than a radical re-design, the distinctive strip has retained the blue and white theme of previous years with the addition of three red stripes each side of the abdomen.